There’s no place like these seven inspiring home bars. In biodynamics, the moon, the stars and a flock of sheep have everything to do with your glass of wine. Bean-to-bar chocolate makers are putting the craft back in cocoa. A Swedish punsch, where to go for steamy hot toddies, and Ruth Reichl on memorable meals and the perfect Martini. Stir like a pro with our favorite barspoons. Phil Farrell wears his eccentricity—and his rubber chickens—on his belt, but his love for beer is no joke. Easy homemade vermouth makes a splash in cocktail and wine glasses. Philadelphia’s bean scene is on a roll with Rival Bros Coffee. A chocolate mousse pie gets dosed with coffee and rum. Plying the uneasy earth with an offering of wine in a post-earthquake Chile. 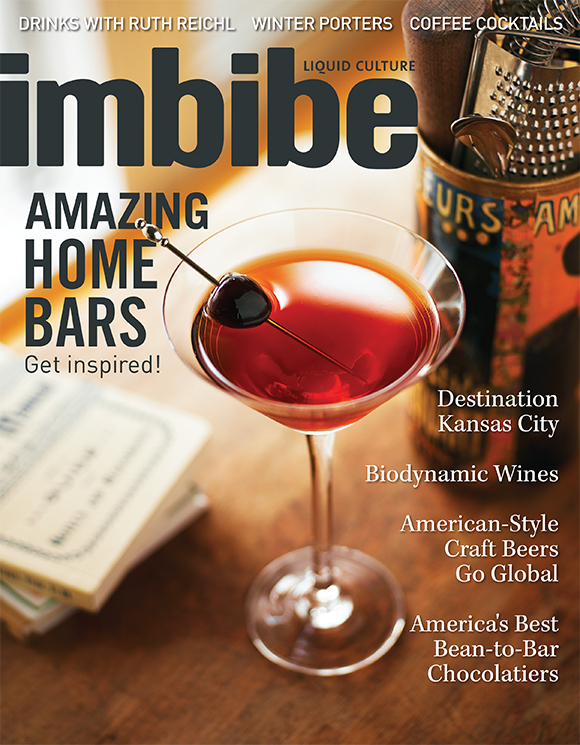 Our annual Imbibe 75 issue will help you start 2019 in the right direction.